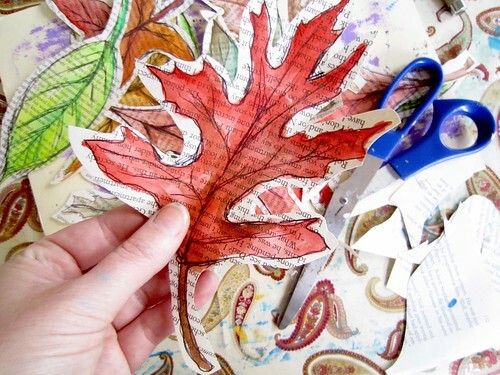 We are heading into my favorite time of year- fall and then winter- and I have SO many fun ideas and tutorials to share! If you are a regular reader then you know that I love coming up with unique wreaths to celebrate seasons and holidays. Since we are already into October (can you believe it?) I am kicking off my fall tutorials and inspiration with a simple and sweet idea that makes use of the most accessible supplies. In a world full of the latest and greatest products, supplies, kits and tools, sometimes I just like to get back to basics- a pen, paint, paper and basic drawing skills. You would be surprised how far you can stretch all of these things! 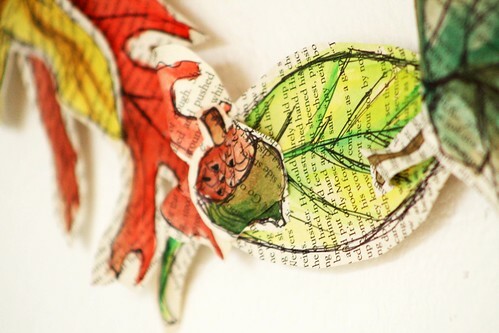 One of my favorite simple projects is this butterfly wreath that I came up with a while back using recycled book pages and watercolor filled drawings and I knew I wanted to use the same concept. 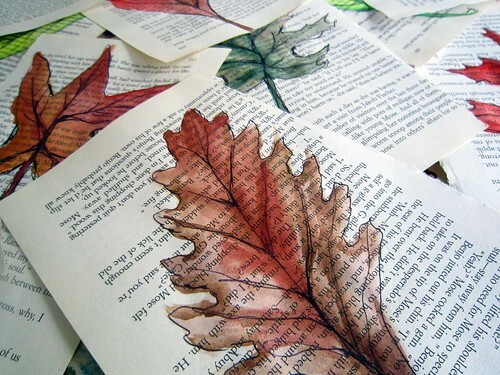 I started by drawing leaves on book pages and using watercolors, I filled the leaves with color. FYI- Watercolors are perfect to use for painting over something (like text on a book page) because they are translucent enough for the page to to show through and create a sense of layers and visual interest. 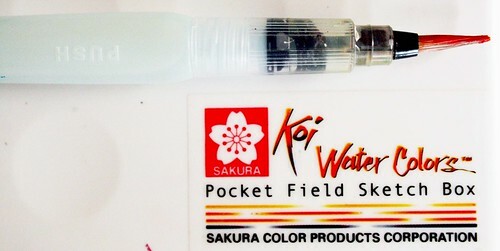 These days I carry my Sakura pocket watercolor box and water brush EVERYWHERE. They are the best for travel and for working on small projects. I created a variety of leaves in fall colors. 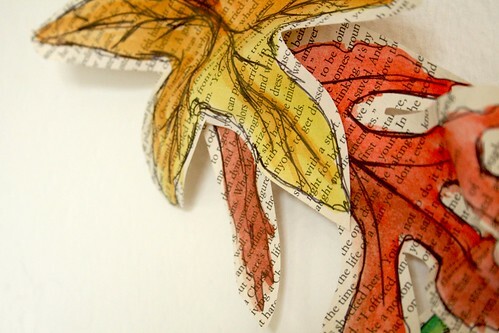 Next I cut out each of the leaves, leaving a little edge of the book page showing. I decided to use an old embroidery hoop which makes a really delicate base for a lightweight wreath. 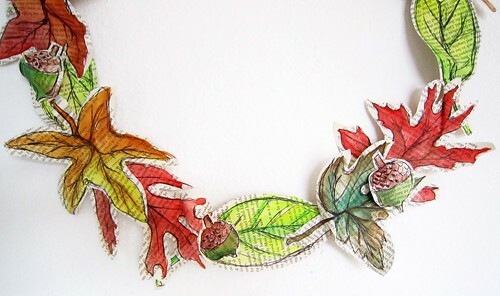 Using hot glue, I glued all of the leaves to the surface of the hoop, alternating colors, shapes and direction. After I glued down all of the leaves, I felt like something was missing. I couldn't resist making some simple acorns that I added around the wreath. 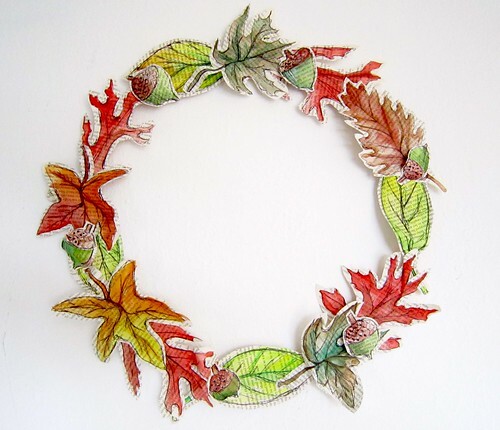 And there you have it- a perfectly pretty fall wreath that I will be adding to our living room wall. LOVE it! Now I know what I was saving those old warped embroidery hoops for! as always i adore your creations and creativity! adorable! 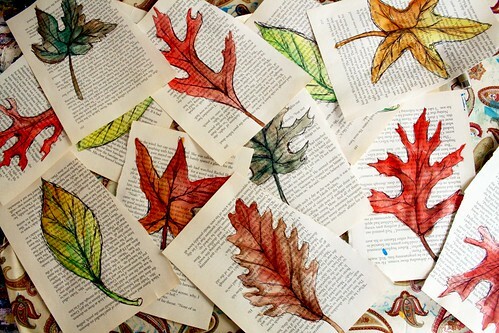 I LOVE painting fall leaves, and this is perf. Beautiful. You are so inspiring. 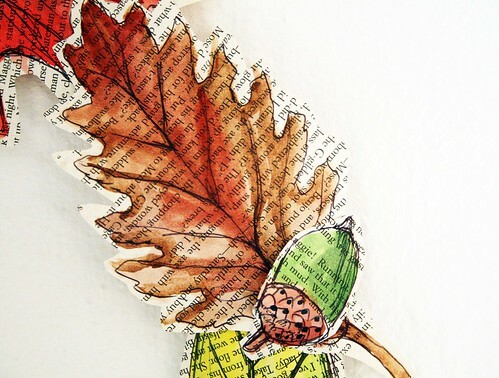 I absolutely love this....Your creativity is soooo inspiring. im so glad you told us what watercolors you were using. i love that stinkin brush, i've just mentally added it to my x-mas list!! So Pretty!!!! And thanks for sharing your paint/brush info.... I was wondering what to get my artist brother for Christmas! Hello Alisa! My name is Karla, I'm from Brazil and like your blog! I posted one of their paps on my blog, which I liked a lot of your work, do not worry, I gave due credit. If you want to take a stop by. Sorry an error in writing, is that I used the google translator. very nice, what a good idea. Beautiful!! You are a FABULOUS painter!! I love water brushes but hate when the paint color travels upwards into the water chamber(Grrr...), does that ever happen to you and if so what prevents that? I'm not sure mine are by Koi (I can't remember but i think they are sakura) so could be my brand??? I love the use of on hand items! No need for "oh, I have to go buy this and that so I can do this one project". You're an incredible artist. Add me to your "Love it" list. It's beautiful and like you said it comes from basic supplies. aack! this is bee-yoo-tee-ful! and now i have to say super drats because i have been working on a wreath tutorial that is exactly this (only without the awesome finesse that you possess). i'll just chalk it up to great minds think alike and pretend we are super friends. heehee. your work is as always gorgeous! 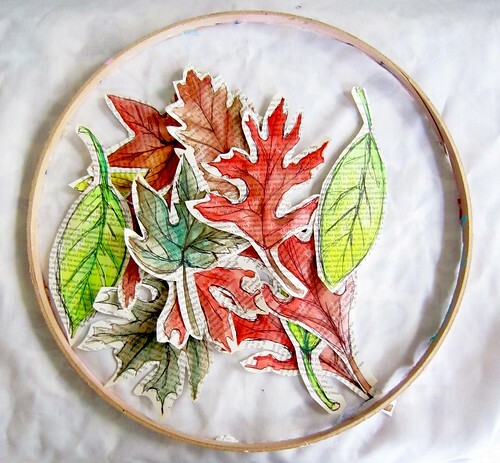 Love this--I'm headed to the Goodwill store to snag some embroidery hoops! This is beautiful - nice work! Thank you for this fun tutorial! I am going to do this with my grandchildren when visiting them next week. 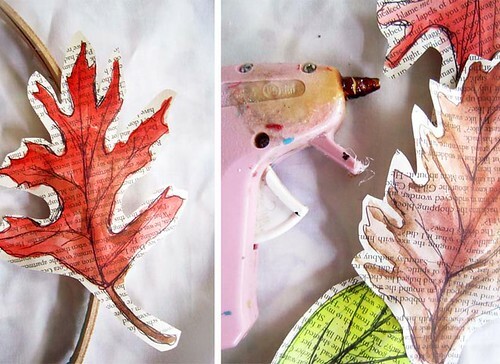 LOVE this idea, I featured you on my blog about Book Page Decorating ideas today. Love your blog! Awesome project...I love it. 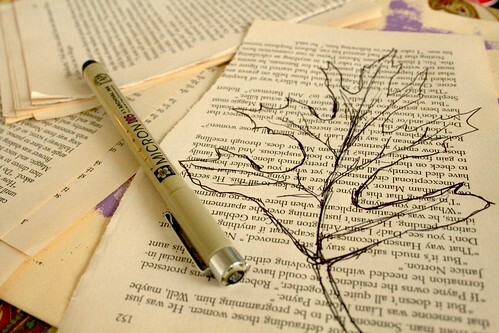 I love using books like this! I quickly looked through your blog. What fun! Things that I could do while I sat with my husband in the evening watching tv! Thanks! I already had some of those water brush thingies. Does the color go up inside yours? lovely! what a great idea, and beautifully done. How charming! Have to try this. 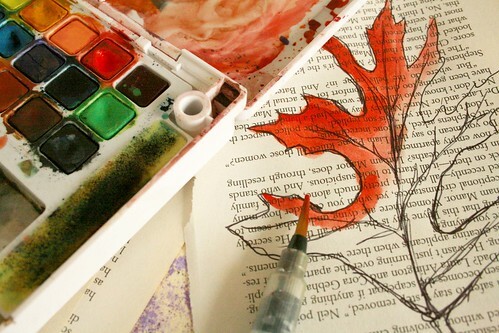 But I REALLY have to check out the Sakura pocket watercolor box. 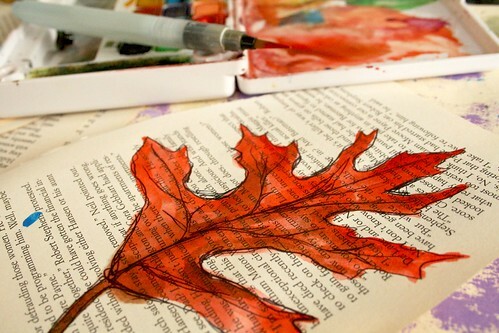 I'm not a watercolorist, but I'd love to have colors with me wherever I go. Who knows? I just might give it a go! This was a great project that I did with my after school kids. They look beautiful hanging in the windows. Thanks for the idea will us it again and again. 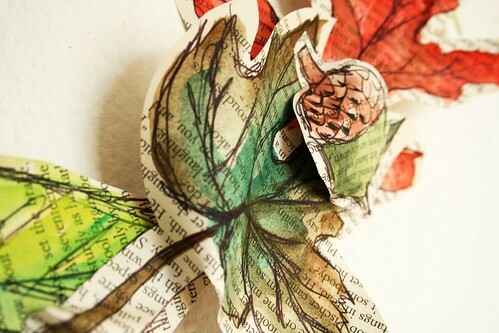 I bought several books from a thrift shop and made this lovely wreath. 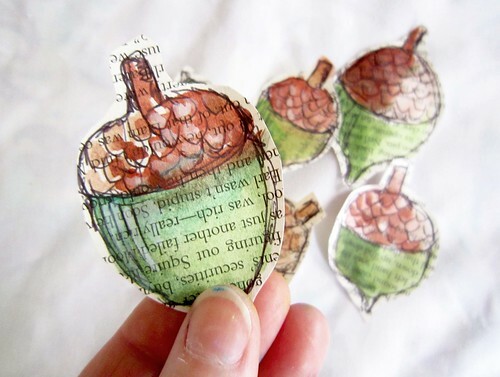 Then I went a step further and cut multiples of each leaf and acorns. Then after painting them, I stacked them 3-D style but interspersing single and double layers around the embroidery ring. The overall look with multiple dimensions looked terrific. I made them for everyone!